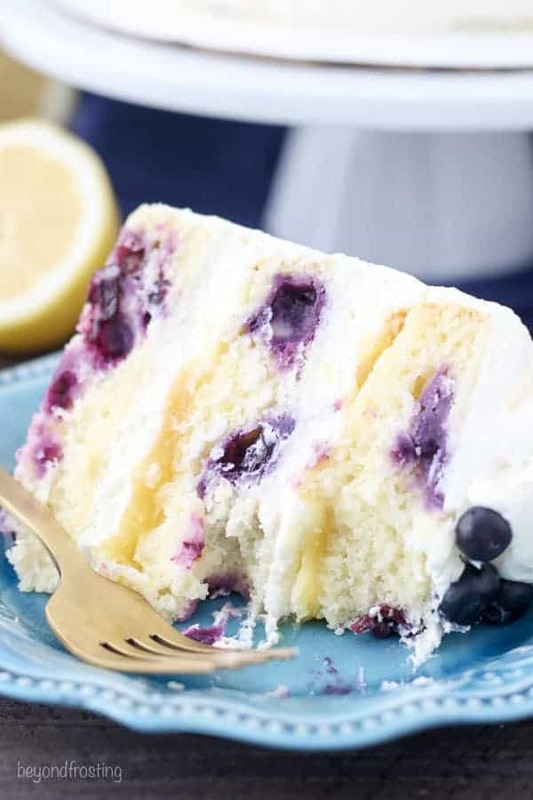 Tangy Lemon Blueberry Mascarpone Layer Cake is a moist lemon cake are loaded with sweet blueberries. 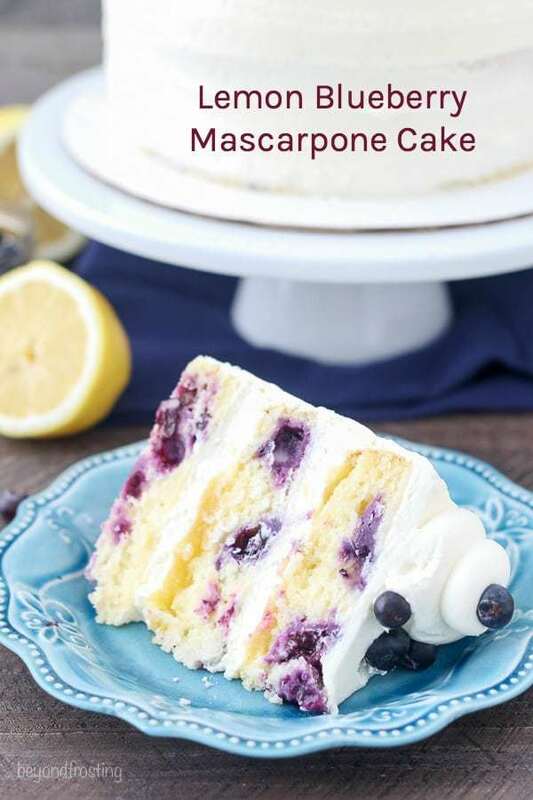 In between each layer of cake is mascarpone whipped cream and a tangy lemon curd. It’s an oil-based cake recipe that stays super moist and is dense like a sponge cake. Cakes on cakes on cake. I can’t get enough. I’m completely obsessed with my moist vanilla cake, (as are you guys to!) and I’ve been making variations that cake ever since. 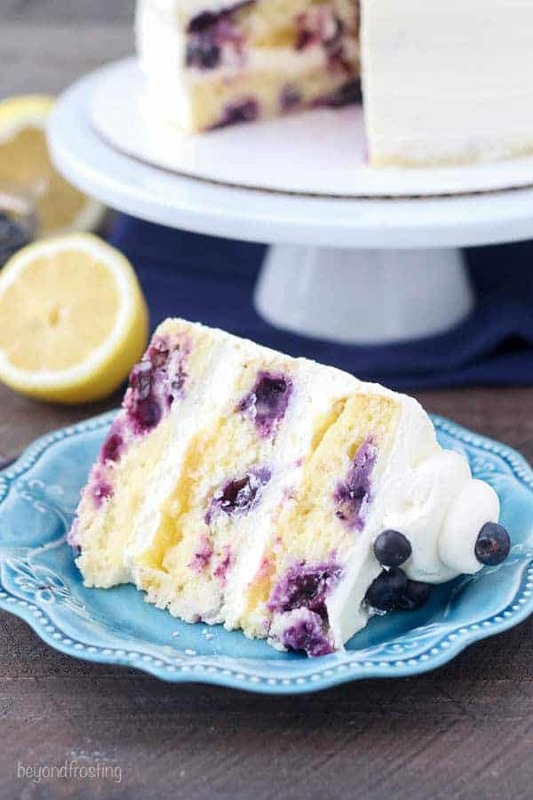 Today I’m sharing a Blueberry Lemon Mascarpone Cake. This cake is the bomb you guys. 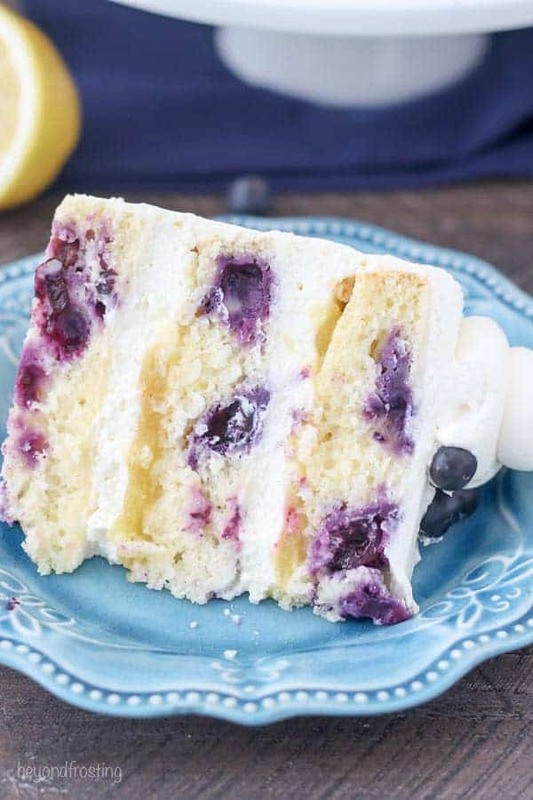 The layers of moist lemon cake are loaded with sweet blueberries. 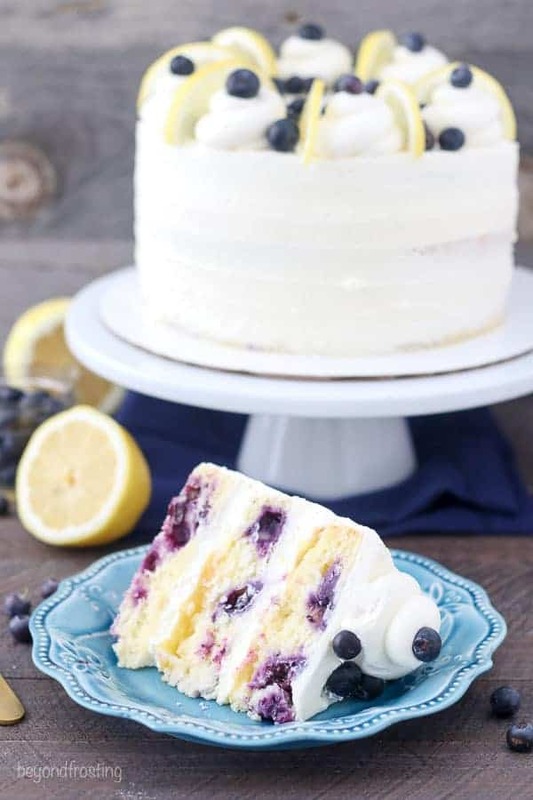 In between each layer of cake is mascarpone whipped cream and a tangy lemon curd. One of my girlfriend referred to this cake as exactly what she’s looking for in a cake, not overly sweet but tons of flavor. 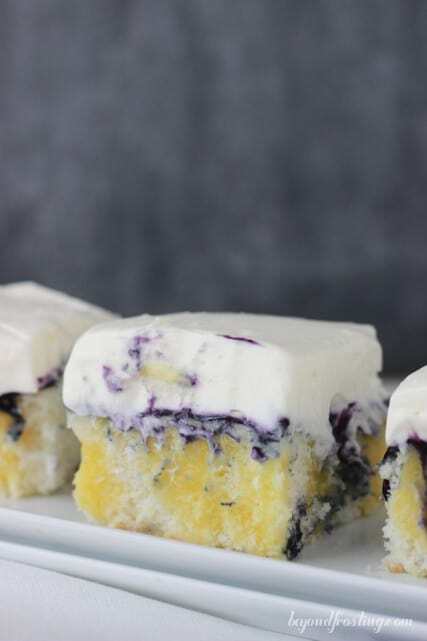 Of course, the lemon and blueberry flavors are a match made in heaven. The lemon cake base is a similar recipe to the one I used for my Lemon Blackberry Cupcakes. It’s an oil-based cake recipe, so there’s no time spent waiting for the butter to come to room temperature. All in all, this takes maybe 10 minutes to prepare. I saved the blueberries until the very end. I tossed the blueberries in some flour to coat them and then gently mixed them into the batter. I also saved a few to drop on top after I filled my pans. Since the batter is so thin, I was worried the blueberries would just drop to the bottom, but they seem to distribute nicely because there isn’t a huge amount of batter in each pan. For the layers of cake, I use three 8-inch baking pans. The cake makes about 5 1/2 cups of batter, so approximately 1 2/3 cups of batter per pan. It’s important that you line the bottom of the pan with parchment paper or 8-inch silicone baking liners. This will ensure you can easily remove the cakes from the pans. I also bake my cakes with bake even stripes. These are used to create a nice even and level cake. It prevents the edges of the cake from cooking too quickly and therefore rising in the middle. If you don’t have bake even stripes, that’s totally fine, you’ll just need to cut the dome of your cakes off with a cake level or serrated knife before you start laying them. If your cake doesn’t rise much, that’s actually fine because your cake is going to need to be flat on top anyway! For the frosting, I went with a simple mascarpone whipped cream. To make this frosting, it starts out like any whipped cream recipe. You beat the heavy whipping cream until soft peaks form. Then add the powdered sugar and continue beating while slowly spooning in the mascarpone whipped cream. The whipped cream will thicken pretty quickly once the mascarpone has been added. This frosting is very light (being that it’s whipped cream and all! ), it’s not overly sweet so it allows the flavors of the cake to really shine through. 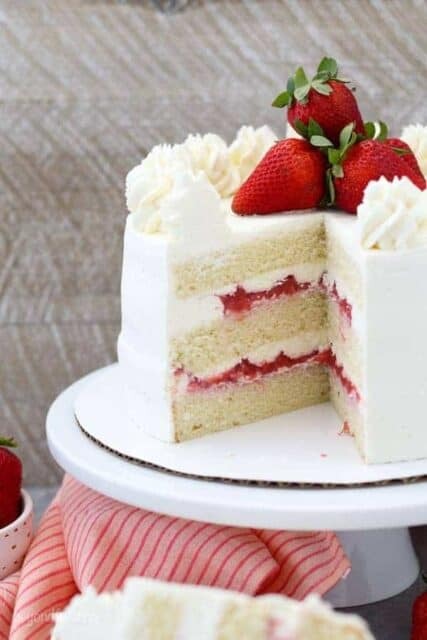 To fill your cake, I suggest filling a piping bag full of the frosting and using that to pipe the layers of frosting, which produces a nice even layer of frosting. Then I took some lemon curd and spread it over the whipped cream. You can make some homemade lemon curd or you can grab a jar at the store. I am lazy and just used a store-bought jar. The lemon curd really elevates the lemon flavor. The cake itself is subtly lemon, so the lemon curd add that burst of tangy flavor. I used half a jar for each layer. This cake needs to be refrigerated because of the mascarpone whipped cream frosting. It can be served right from the refrigerator because the frosting stays nice and soft. You can garnish this cake with fresh fruit like lemon slices and leftover berries. 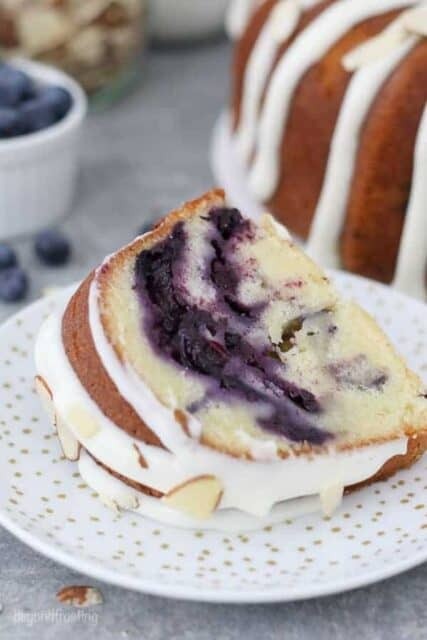 My favorite bites of cake are the ones with a giant blueberry! I was inspired to make this cake from my bestie Lindsay who makes the most gorgeous cakes, including her Lemon Mascarpone Layer Cake. 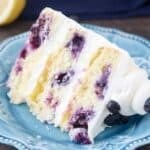 Tangy Lemon Blueberry Mascarpone Layer Cake is a moist lemon cake are loaded with sweet blueberries. 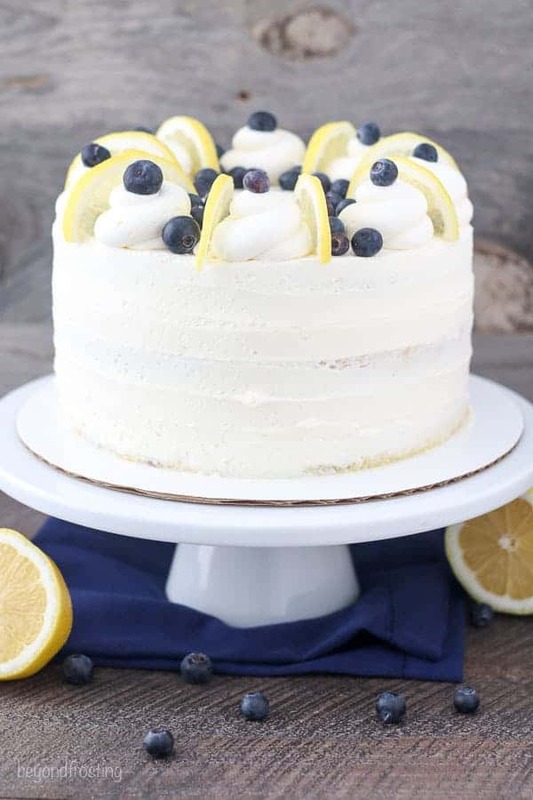 In between each layer of cake is mascarpone whipped cream and a tangy lemon curd. For the cake: Preheat the oven to 350°F. Prepare three 8-inch round baking pans, line the bottom with parchment paper and grease the sides. Prepare your bake even stripes if desired. In a large mixing bowl, combine the sugar, vegetable oil, eggs, and lemon extract. Beat on medium speed until the eggs and oil are well incorporated and the batter is lighter in color, about 2 minutes. Scrape down the bowl as needed. Next, zest 2 lemons into the batter and then juice the lemons. Add 4 tablespoons of lemon juice to the batter as well as the sour cream and beat until well combined. Add half the flour followed by the baking powder and salt and beat on low speed while pouring in half of the buttermilk and mix just until the flour starts to incorporate. Finally add the remaining flour, mixing on low speed while pouring in the remaining buttermilk and beating until all of the ingredients are well combined. Toss the blueberries with 2 tablespoons of flour. Then gently fold the blueberries into the batter, saving a small handful to drop on top. Divide the batter evenly between the three pan, about 1 2/3 cups of batter per pan. Drop the remaining blueberries on top. Bake at 350°F for 20-23 minutes. Rotate your pans in the oven halfway through baking. Test the cake for doneness by inserting a toothpick into the center of the cake. If the toothpick comes out clean, you cake is done. Remove from the oven and allow to cool completely. Pour the heavy whipping cream into the chilled bowl and use an electric mixer to beat the heavy cream on medium-high speed until the cream starts to thicken. Slowly add the powdered sugar and vanilla extract and continue beating on high speed until soft peaks form. Next, spoon the mascarpone into the bowl and continue beating at a high speed until stiff peaks form. To assemble the cake, use a cake leveler to cut the domes off the top of the cake. Place a dollop of frosting on your cake board and place the bottom layer of cake on top of that. Place half of the whipped cream in a large piping bag fitted with a large open round tip, or simply cut off the end of the piping bag. Pipe a layer of frosting and spread evenly. Then spread half of the lemon curd over mascarpone filling. Add the second layer of cake and repeat the above steps using all of the remaining lemon curd. Next, add the final layer of cake on top. Proceed to frost the top and sides of the cake using your offset spatula. Once the sides of the cake are covered, use you icing smoother to remove any excess frosting. You can take the end of your offset spatula and gently place them against the sides of the cake as your rotate your cake to add a little texture. Use remaining frosting to pipe the florets on the top of the cake using an Ateco 809 tip (large open round). Garnish with lemon slices and leftover blueberries. This cake must be refrigerated. Is there the chance that I over mixed the icing (it now looks a hint more yellow & isn’t as smooth looking)? Is there a fix before I start to use & layer? Hi Denise, I am sorry I didn’t see this earlier. It is possible to over mix but that would make it look a bit grainy. Hi Rachel, I have not tried it myself, but I did do a test batch recently of my moist vanilla cake, substituting an all-purpose 1:1 GF flour and it baked up just fine. This lemon cake recipe is similar, so think it should work? Hello.Can I use lemon marmalade instead of curd?. I have not tried it but as long as the consistency is similar, it should be fine!